Spurred on by the advent of digital radio and the conversion to digital broadcast television, WKNO set out a capital plan to construct a new digital media center. 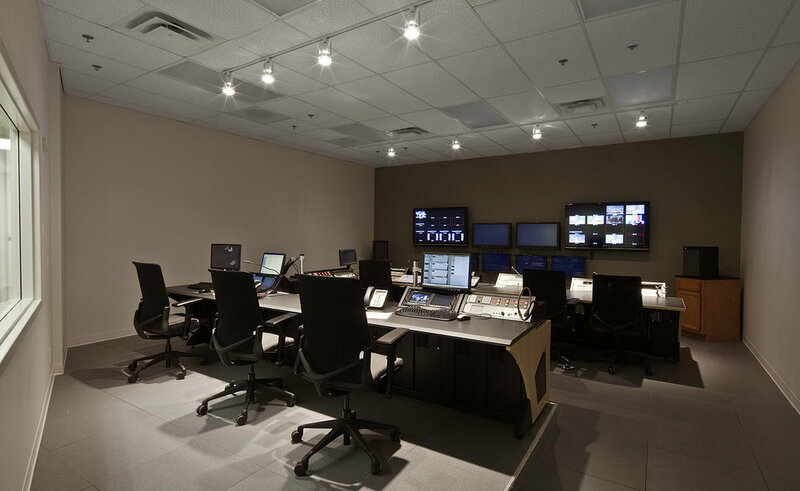 The 39,000 sf, $15 million facility houses two television studios, a digital editing suite, a radio broadcasting suite for two simultaneous independent radio feeds as well (as recording capabilities for producing a third program for later broadcast), and support functions, which include a news room and administrative offices. Raised floor systems for cable management and “pod” systems for sound isolation provide a clean, technical appearance for the facility that makes its function transparent to visitors and staff alike. The most active areas are located in view of a public tour route through the building, an approach that is vital to an institution that survives on donations, while the pathways for supporting the technical function are protected from potential disruption by acoustical and physical separation.